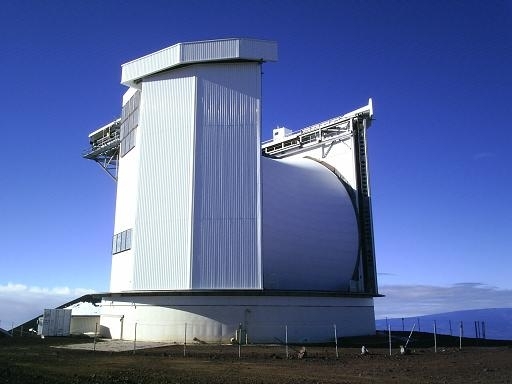 The East Asian Observatory operates the James Clerk Maxwell Telescope located near the summit of Mauna Kea on the Big Island of Hawaii. The JCMT on Mauna Kea. The JCMT is the largest single-dish telescope in the world dedicated to detecting submillimetre radiation. 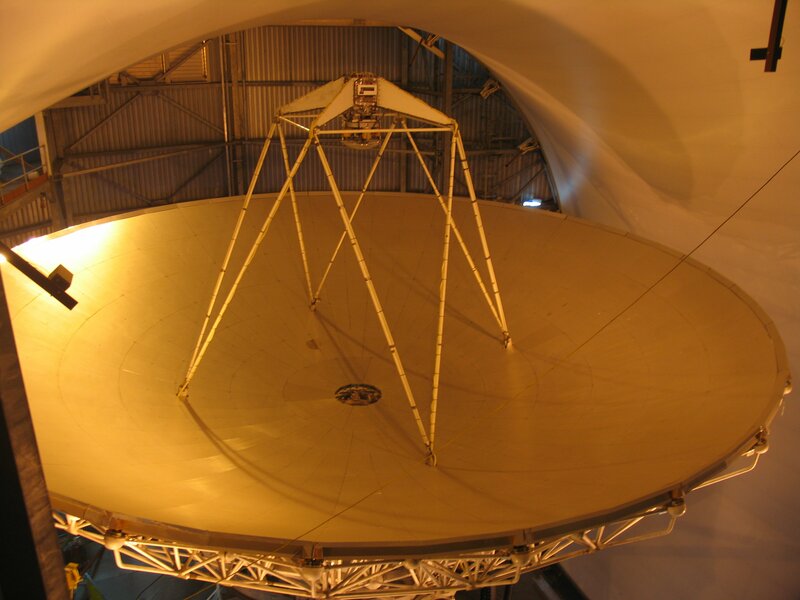 Its 15-metre (50-foot) dish looks at the sky with instruments that tell us about the cold Universe in different ways. Operating between the infrared and radio waves, observing at wavelengths between 1.4 and 0.4mm, it uses some of the most sensitive and sophisticated instrumentation to detect the coldest material in the Universe, only a few tens of degrees above absolute zero. Water vapour in the Earth’s atmosphere intercepts this radiation, making the high and dry site of Mauna Kea vitally important for the research performed at the JCMT. 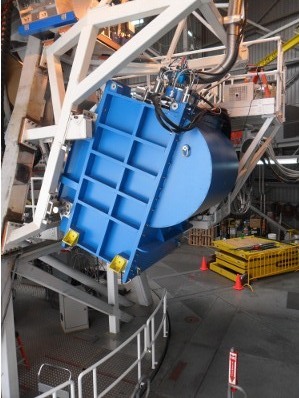 The JCMT’s dish, as wide as a basketball court, collects the submillimetre light and feeds it to a set of sensitive detectors. The dish is protected from wind, sand and birds by a sailcloth-like membrane or Gore-Tex. In between the stars are giant clouds where stars and solar systems are born. They are made of gas (mostly molecular hydrogen – H2) and cosmic dust (tiny particles of silicate and carbon). The clouds are some of the coldest objects in the Universe – so cold that their “heat glow” is invisible to human eyes. We need specialised telescopes and instruments to see this submillimetre radiation. The newest instrument on the JCMT is SCUBA-2 which is the most powerful camera of its kind. New technology and novel design means it maps the sky hundreds of times faster than its predecessor, SCUBA. 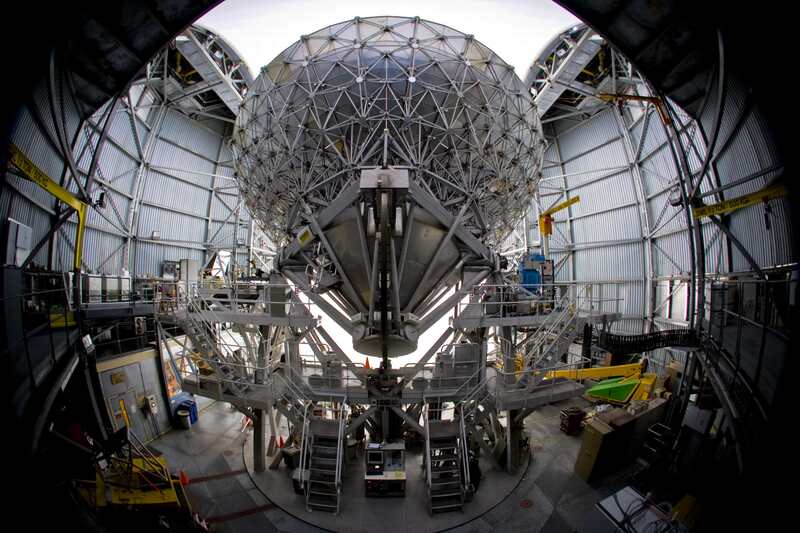 SCUBA-2 will keep the JCMT at the forefront of submillimetre astronomy, complementing the Submillimeter Array on Mauna Kea and forthcoming telescopes such as the Atacama Large Millimeter Array in Chile. The SCUBA-2 camera can take pictures showing the faint heat glow of interstellar dust grains. These fine particles, like soot or sand, are at temperatures below -400F. SCUBA-2 itself is kept even colder than this, to improve its sensitivity. In its jacket of liquid helium it gets down to less than a tenth of a degree above absolute zero, around -459.5F! A map of the center of our Galaxy shows a complex region of shells, filaments, and clouds like cotton candy in the heart of the Milky Way. This exotic region lies 27000 light years from Earth, and our view of it in visible light is obscured by the intervening dust. The heart of the Milky Way seen by the JCMT. Far beyond our Milky Way, SCUBA-2 has seen galaxies more than ten billion light years away. These galaxies are enshrouded in dust at the edge of the universe, and tell us about star birth more than 90% of the way back to the start of time. 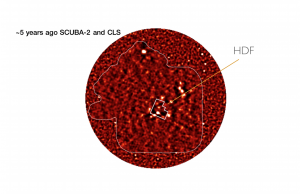 The Hubble Deep Field seen by SCUBA-2’s predecessor, SCUBA on JCMT. Closer to home, pictures of the dust around nearby stars provide tell-tale evidence for new planets around suns other than our own. 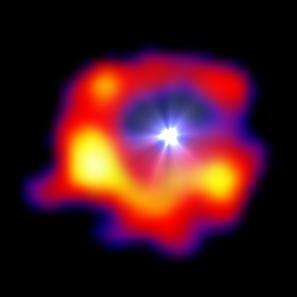 The gases and dust grains seen by the JCMT are not just important for the life cycle of stars. They are also the origin of all chemical elements heavier than Helium in the stars, clouds, planets, and in our own bodies. We are all made of stardust. The JCMT also has ‘heterodyne receivers’ which detect light from gas molecules in space. These molecules emit characteristic submillimetre radiation patterns when they rotate. The patterns are ‘fingerprints’ that tell us about the temperature, density, or motion of the gas. HARP is such an instrument which combines a camera and a spectrometer. This means we can learn about the chemistry of interstellar gas, its temperature, density and motion. The nearest massive star formation to Earth is happening 1500 light years away in the constellation of Orion, the Hunter. In this cloud new stars are born, and into this stars disperse or explode as they die. 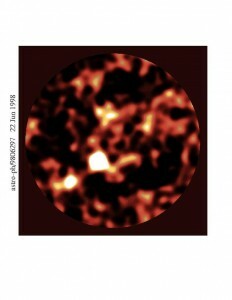 HARP’s images of Orion show the presence of carbon monoxide. 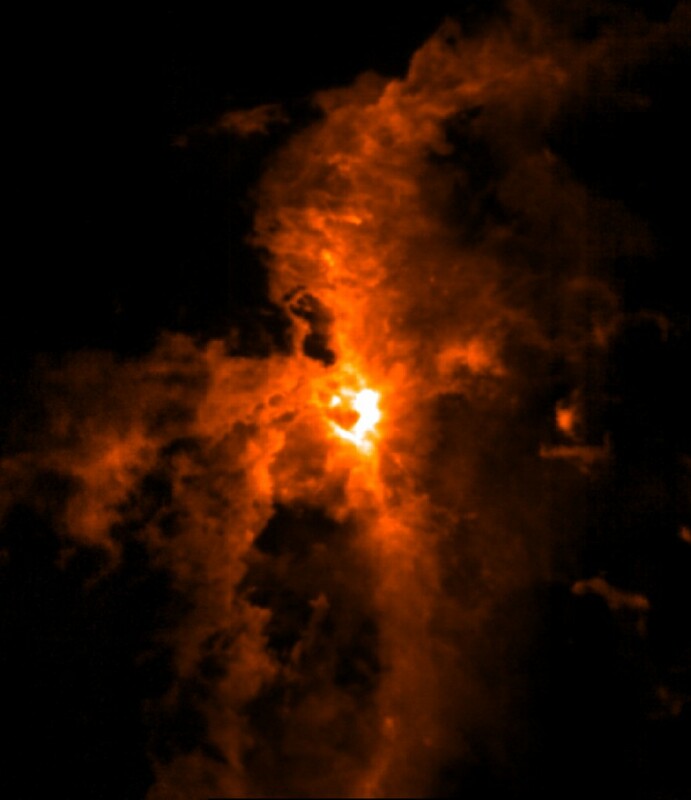 The bright region in the center reveals new star formation. Evident is the surrounding gas undergoing streaming motions both to and away from the region. Orion seen with HARP on JCMT. A spectrum obtained with HARP towards the Orion Nebula showing the presence there of carbon monosulfide and other molecules. A carbon monoxide spectrum obtained with HARP in the direction of the Galactic Centre showing the presence of three cold clouds with small line widths and one warmer cloud with larger line width, which move at different velocities along the line of sight. 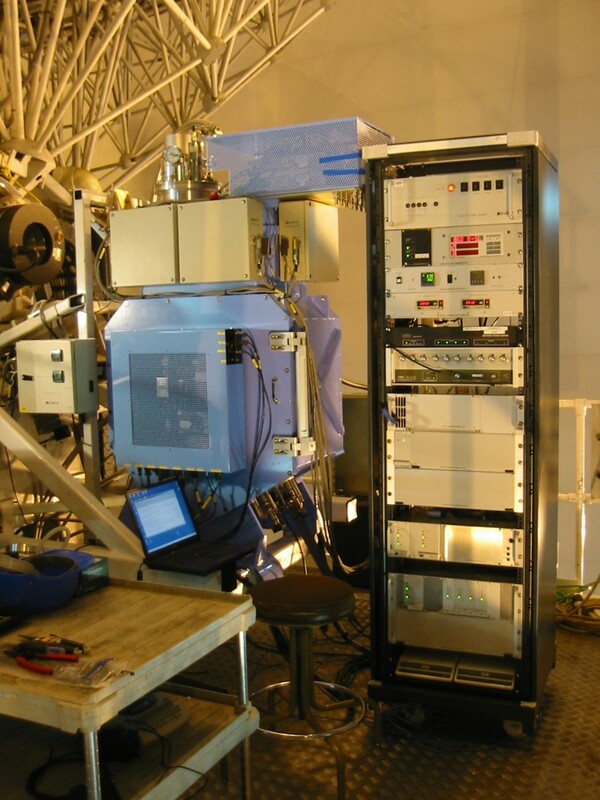 In 2016, the JCMT began offering the use of a polarimeter (POL-2) to it’s user community. POL-2 itself is not a detector, it works in conjunction with SCUBA-2 and it’s detectors. In space, many objects and regions are associated with magnetic fields. Magnetic fields protect planets from harmful radiation. Dust grains exposed to a magnetic field become aligned to that field. Radiation emitted by the aligned dust becomes polarized. 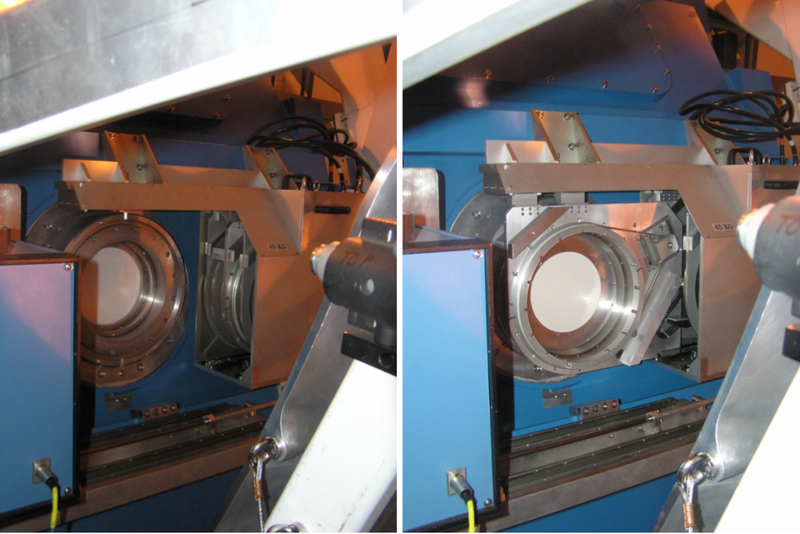 When we use POL-2, the JCMT can detect and examine polarized light! Check out this helpful poster on JCMT Magnetism and Polarization in Space. The left image shows the SCUBA-2 window. The right image shows the components of POL-2 inserted in front of the SCUBA-2 window: the calibrator grid, rotating half-wave-plate (HWP) and the analyser grid. The calibrator grid is only inserted for test purposes. 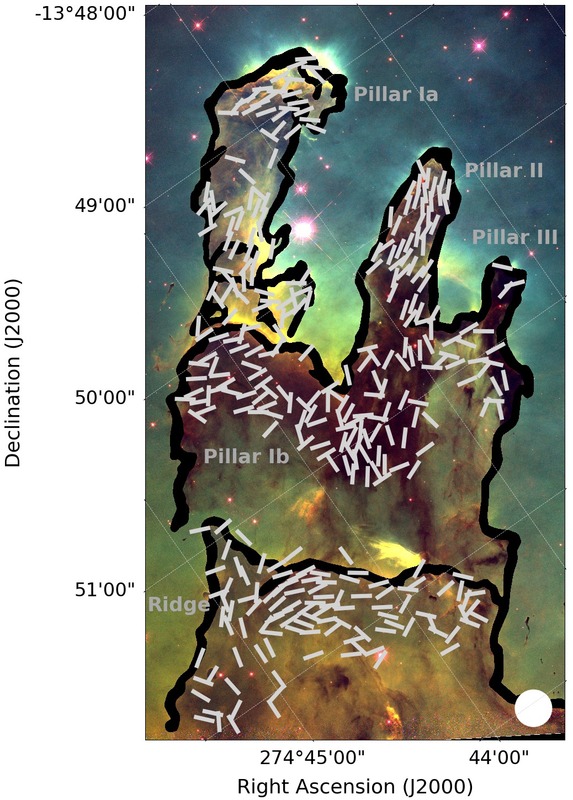 An illustrative figure of the BISTRO magnetic field vectors observed in the Pillars of Creation, overlaid on a HST 502 nm, 657 nm and 673 nm composite – HST imaging from Hester et al. (1996, AJ 111, 2349). 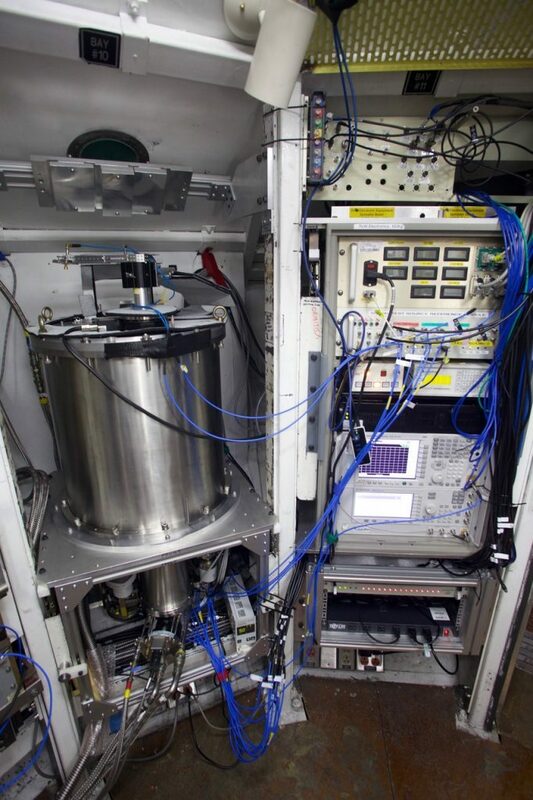 The GLT receiver installed inside the receiver cabin on the JCMT. For a brief look at the history of JCMT, read A Personal Retrospective by Richard Hills. Check out our JCMT Videos page to learn more!